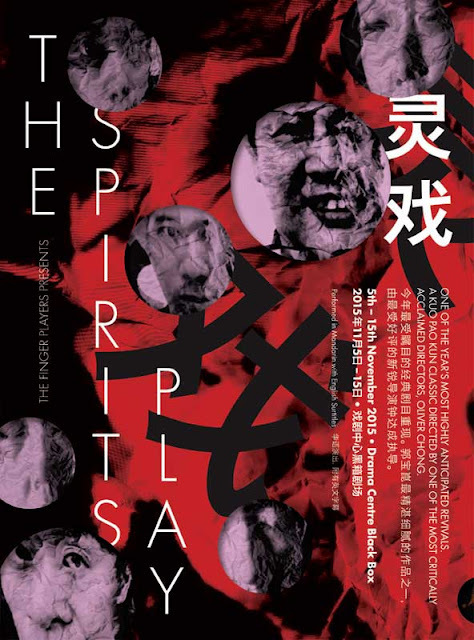 This is Ong Keng Sen's last year as Festival Director of the Singapore International Festival of Arts. Over the past four editions of the festival, Ong has curated a truly diverse and eclectic range of productions and always helmed a signature piece of his own. His genre-bending, cross-cultural style, which frequently blends Western and Eastern theatrical elements, has polarized audiences (think science fiction, pop-art opera Facing Goya in 2014 or kabuki-themed Shakespearean pastiche Sandaime Richard last year) but nowhere is his directorial vision more coherent and thematically resonant than in this extraordinary production. Euripides' classic tragedy of the women of Troy and their queen Hecuba, who are about to be carted off as war slaves to Greece following the violent Trojan War, is recast here as a Korean opera or changgeuk and performed by members of National Theater of Korea. 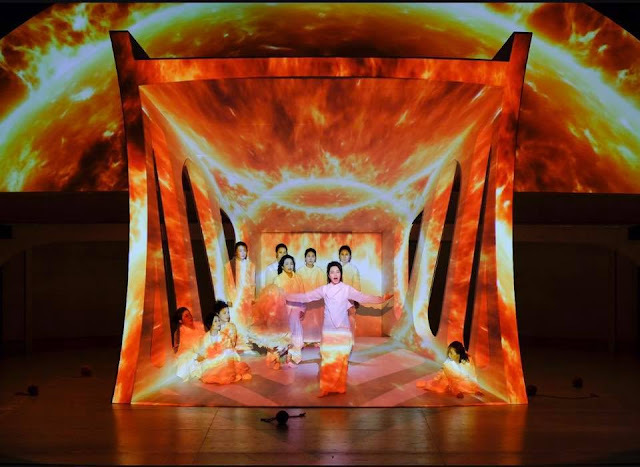 The changgeuk is in turn stripped down to its most basic component, pansori, a traditional genre of musical storytelling involving a single actor and musician (composed painstakingly by cultural icon Ahn Sook Sun). What this gives us is a production that is stunning in its simplicity and unrelenting in its evocation of grief in the face of adversity. 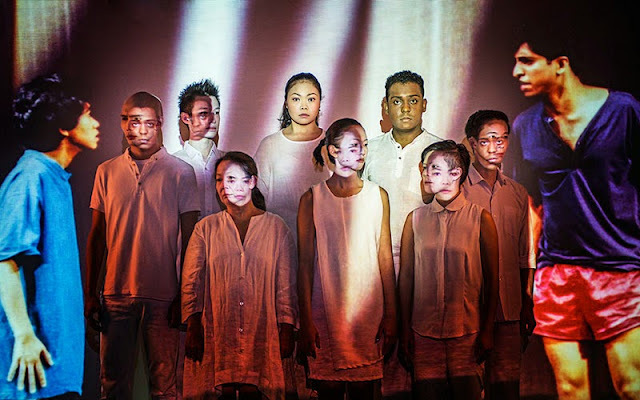 In this taut version by Korean playwright Bae Sam-sik, based in turn on Jean-Paul Sartre's 1965 adaptation of Euripides' text, a prologue by a celestial Soul of Souls on the state of war launches us straight into the action. The defeated Hecuba lies crumpled in grief at the centre of the stage surrounded by a chorus of eight women. The women, who never leave the stage, are overwrought with anguish at their predicament but remain quietly steadfast, not wanting to leave their homeland like chattel. One by one, fate deals its blows to the beleaguered Hecuba. An messenger from the Greeks announces that she is to become a slave while her daughter Cassandra is to be taken as a concubine to Agamemnon. Her daughter-in-law, the widowed Andromache, is separated from her newborn child Astyanax and to be sent as a concubine to another Greek warrior. Most crushingly, the Greeks order Astyanax, Hecuba's grandchild and heir to the Trojan throne, to be thrown off a cliff. Kim Kum-mi's Hecuba, giving a tremendous, soul-crushing performance, arrests us with vocals that convey sadness and rage in their every note. There are many times in the play that we see tears streaming down the cheeks of these performers and the quality of the pansori singing is ragged and discordant, lucid and lacerating - the sound, indeed, of human tragedy. Yet all this is tempered with a lightness. The music, composed by Jung Jae Il, ebbs and flows with emotion and the chorus incorporates elements of K-pop, giving the changgeuk a modern edge. The movement work, by esteemed Beijing choreographer Wen Hui, also reminds us of these women's domestic roots. Clad in immaculate white, their only notable prop is a ball of red yarn which they swing around, unravel and clutch in turn. It's a potent symbol of blood and pain - the cost of being victims to war and seeing their world ripped to shreds by men. Yi So-yeon as doomed seer Cassandra conveys a delicate, ethereal innocence, dreamily heading towards her destiny with a half-smile. In contrast, Kim Ji-sook's fiery Andromache displays obvious contempt towards her mother-in-law for being responsible for the tragedy that has befallen her: it is after all, Hecuba's son Paris who fell prey to Helen of Troy, sparking the whole vicious war when Helen's enraged husband Menelaus, the King of Sparta, pursued revenge and decimated the city of Troy. Ong's treatment of Helen, using a male pansori performer (Kim Jun-soo), is another revelation. 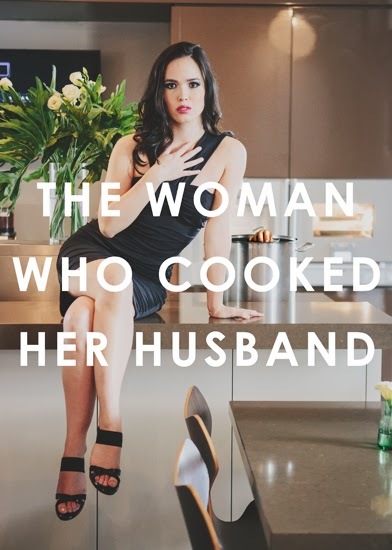 The gender reversal neatly conveys that sense of otherness associated with the character - the outsider both reviled for her sexuality and renowned for her beauty. This contrast is also underscored aurally; Helen is the only character who sings to sultry piano music from a baby grand wheeled out on stage instead of traditional musical instruments. When confronted by the enraged Menelaus (a tempestuous Choi Ho-sung), Kim Jun-soo's androgynous Helen artfully manipulates his emotions by blaming her actions on the whims of the gods and wrangles her way out of immediate death, heading back to Greece with quiet satisfaction. Ong works with a superb team to bring this classic yet wonderfully contemporary retelling of the tragedy to life. Myung Hee Cho's set, which features a central, columned platform flanked by staircases, is both traditional and futuristic. It also forms the perfect canvas for Austin Switser's video projections which accentuate the heady emotions on stage. As Cassandra emerges, images of fire make it seem like she herself is engulfed by flames. At other times, stars and constellations wash over the women's faces as if their tragedy is embraced by Mother Nature herself. The production is brilliantly lit by Scott Zielinski, who collaborated with Ong in previous productions such as Lear Dreaming and Sandaime Richard. He plays not just with exquisite colours and fades but implicates the audience in the action by turning up the house lights to signal the arrival of the Greeks from the back of the theatre and creating a simmering unease whenever the women gaze out into the crowd at the unseen action around them. 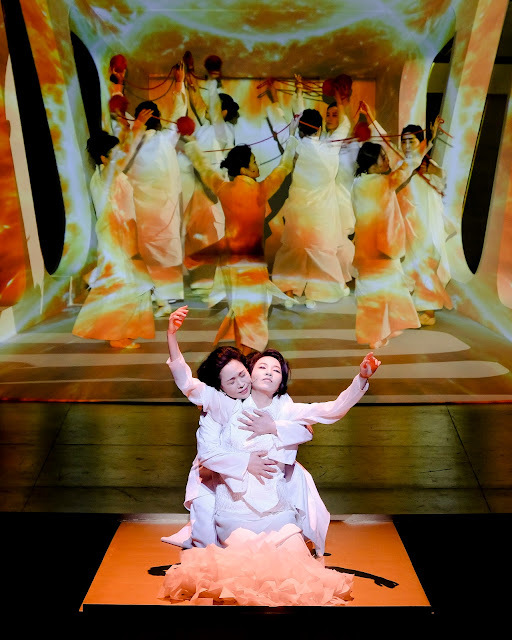 What Ong's Korean version of Trojan Women ultimately achieves is not just clever intercultural fusion but a deeply reverent homage to a theatre classic, one which throbs with sheer intensity. Watching these incredible performers, one is transplanted to the amphitheatres of yore, simply enchanted by the scale of human emotion on display. Here is a story that has survived numerous iterations and languages but still stands blazing, three thousand years on, charting the same cycle of pain. The final image, where the women of Troy climb to the roof of the set to survey their city one last time before they depart, remains with us long after the play. When all is said and done, this is a story about standing firm and true to one's ideals. The bodies of these women may cede but their spirit lives on.